Winter has been and gone and we are now in Spring. It’s time to start thinking about cleaning and decluttering your home. You owe it to yourself and family to enjoy a clean that’s more than dirt-deep. Think allergen-deep. And spring cleaning isn’t something to dread it’s about being proud of your home and being able to show it off to friends and family. Follow our easy spring cleaning tips and tricks. Find out the main areas of your home that need the most work? Do you skip some areas during routine cleaning? These are the best places to start. Regardless of where you start, having a plan for when you’re tackling each room will keep you focused on the task at hand. A disorganized home adds to stress levels. 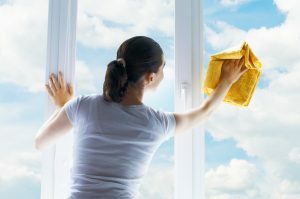 The inhaling of dust gathered in your home – combined with the psychological stress of coming home to a pile of unsorted laundry or paperwork after a hard day – can take its toll on you. 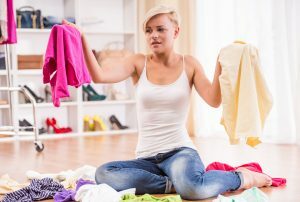 Spend time organizing your closets, spring cleaning your office, and take a look into that junk drawer to rid your life of any unnecessary stress. When you spring clean your home, it’s important to start from the ceiling down. This will force debris downwards and ensure you do not re-dust or re-clean your lower space. If you have a vacuum with a long extension hose, use it to get cobwebs and dust from your ceilings and fans. Then clean your furniture and other items before vacuuming all the dust from your floors. You’ll be surprised how much dirt, dust and hair build up in your carpet. This can be especially bad in bedrooms and dining rooms, where you’re less likely to move bulky furniture around when you’re cleaning. A deep clean will help restore the carpet’s colour and texture. 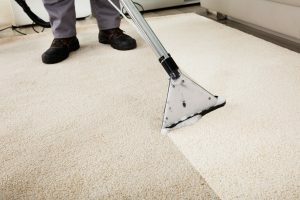 Using a high-performance vacuum cleaner or hiring a professional will allow you to breathe new life into your carpets. People almost always think to clean their floors, but they typically forget about walls and windows. Most dust settles on the floor and other surfaces, but not all of it. Just use a damp towel to wipe down walls and blinds. When it comes to the windows, using our Flourish Window and Glass Cleaner with a microfibre cloth is a great way to clean windows. 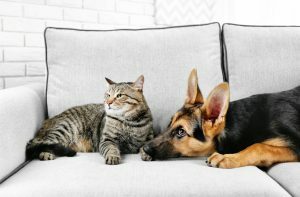 Pets are a delight to live with, but a menace when it comes to keeping your home clean. Cats and dogs especially will cast their hairs everywhere. That’s where a pair of rubber gloves comes in handy. Because of the material, they’re made from, and the friction it creates, hairs will naturally stick to them. So, whether you need to de-hair your sofa, curtains or bedding, your trusty rubber gloves can sort you out. Failing that, a trusty lint roller work wonders on removing pet hairs from fabric. 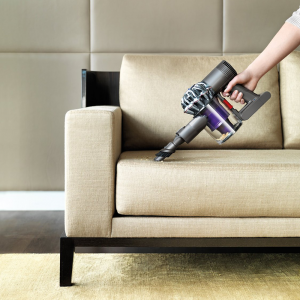 Our Carpet and Upholstery cleaner makes light work of those tough to remove dirt and stains. Improving your indoor air quality will lift all areas of the home or workplace. The Microburst air freshener keeps air clean and fresh throughout the year. It’s an inexpensive way to make sure you’re breathing clean, healthy air. If allergens, indoor chemicals, or odors are a larger concern for you, you can also consider an air purifier. Check out Hygienic Concepts range of cleaning supplies, products and equipment using the menu at the top of this page!